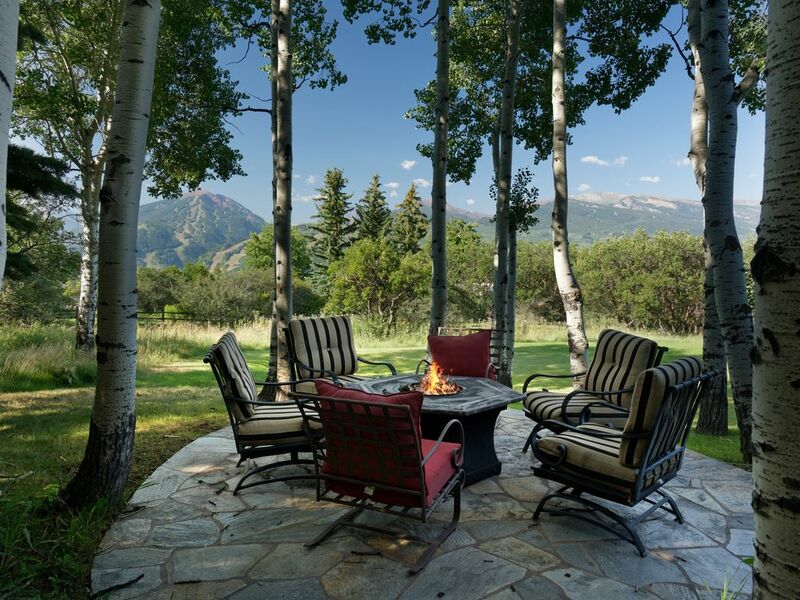 PRIVATE HOME IN ASPEN'S ONLY GATED COMMUNITY! AMAZING FAMILY HOME WITH INCREDIBLE ROCKY MOUNTAIN VIEWS! HIKE ON SUNNYSIDE TRAIL RIGHT OUT YOUR BACKDOOR. PRIVATE TENNIS COURTS AVAILABLE WITHIN STARWOOD. VERY PEACEFUL AND RELAXING - YOU WILL NOT WANT TO LEAVE THE HOUSE. LOTS OF DEER LIKE OUR HOUSE TOO! WE LOVE THIS PROPERTY BECAUSE OF THE BEAUTY THAT SURROUNDS OUR HOUSE. WE HAVE TOTAL PRIVACY AND QUIET. HANGING OUT BY THE POOL IN THE SUMMER CANNOT BE BEAT. WE ARE SO CLOCE TO TOWN BUT YOU FEEL WORLDS AWAY WHEN YOU ARE HERE AT THE HOUSE. WE CAN WATCH ALL THE FIREWORKS YEAR ROUND FROM OUR DECK. VIEWS OF ASPEN, HAYDEN, HIGHLANDS, BUTTERMILK, PYRAMID, SNOWMASS AND SOPRIS PEAKS. View was beautiful; however, the house was not well maintained. Stormi, the house manager, was amazing and a delight to work with. The house was not well maintained, list of items that did not work include the oven, fire pits, one of the grills, and the steam room. Owner was not interested in repairing any of the items. Disappointing for a luxury rental. Our home was recently remodeled, and is in great shape. We live in this home full time and keep it in great working order. The problem with the oven was not communicated to us in time to fix during their stay. It was fixed shortly after they left. The fire pits work, not sure if they were following the lighting procedure properly. We do not have a steam shower. The grill by the pool simply needed the propane tank changed out, and we keep spares at the house. We have a strict no smoking policy for our house. The reason for this renters unfavorable review, was because we discovered upon their departure, cigarette butts in our trash and the smell of cigarette smoke in the house. We thought we would have to have the smoke smell professionally mitigated, so we withheld part of the security deposit. Our normal cleaning crew were able to get rid of the smells, so we returned all of the deposit to these renters. We had a fabulous stay at your home in Aspen, Colorado. The vacation rental was amazing. There were spectacular views of the mountains from most sides of the house. The house was well appointed, and extravagently decorated. The kitchen was well-stocked, and there was a oversized stainless steel refrigerator with an ice maker. We really enjoyed the pool area and hottub which also had amazing views, as well as the large, flat yard where many games of whiffle ball was held! Probably the most exciting thing about the house was the pet fox that visited every night for a quick snack. The property was very clean and well-maintained. The owners were always very helpful and prompt in answering our multitude of questions about the house and the surrounding area. I would recommend going on hikes in the area, white-water raftng, horseback riding and driving over to the Maroon Bells. For dinner, we enjoyed sitting outside at Woody's Tavern and the Red Onion. There were also lots of games and movies at the house. I would certainly recommend this property! We had a wonderful time at this house - it was like having a mountain resort to ourselves. The house easily accommodated our two families. There is lots of space inside and out, including beautiful furniture, fabulous outdoor sitting areas and gorgeous views. For those who need to work a bit, there is WiFi, and for those who like to cook, the kitchen is spacious and had everything we needed, including a griddle for pancakes and two barbeques. The pool is surrounded by trees and gets both sun and shade. Bedrooms and bathrooms are spacious with high-end finishes. This house is in a beautiful neighborhood and very close to town. A fabulous vacation.